This paper develops theoretical and quantitative analysis to identify the potential synergies and trade-offs inherent in various policy instruments that address agricultural productivity, climate change mitigation and adaptation, and water quality objectives. The workshop discussed leading edge developments of the use of agricultural “Big Data” to develop indicators that can be used for the monitoring, evaluation and design of agri-environmental policies. The workshop discussed research results and exchanged practical experience on how governments and other actors can facilitate change in agricultural and water policies. 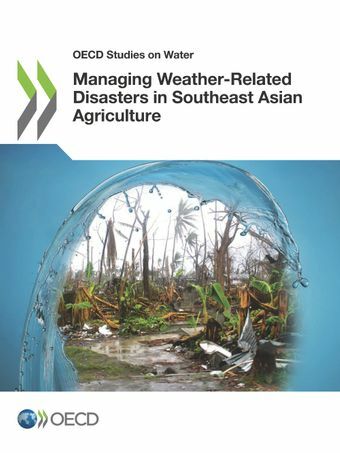 This study reviews policy approaches to droughts, floods and typhoons in Myanmar, the Philippines, Thailand and Viet Nam in an effort to identify good practices and strengthen the resilience of the agricultural sector. Global demand for food is estimated to double by 2050. Natural resources for agriculture and fisheries (such as land and water) will come under increasing pressure from urbanisation and industrialisation. Farming and fishing have significant impacts on the environment. Climate change will also have an effect on agriculture and food production. The challenge for policy makers is to meet increasing demands for food and resources while minimising environmental and social pressure. Agriculture is one of the few sectors that can both contribute to mitigation and sequestration of carbon emissions and accounting for agriculture’s carbon footprint is necessary, particularly if agriculture is included in greenhouse gas reduction commitments. However, the range and variability of estimates, and the complexity and uncertainty of accounting for indirect land use change remain to be resolved. As a major user of land in many countries agriculture has had, and continues to have, a large impact on biodiversity and ecosystems. Agro-ecosystems, biodiversity and agriculture are closely interconnected; ecological functions and ecosystem services, such as soil structure and fertility maintenance, nutrient cycling, pollination, and the regulation of pests and diseases are vital for crop production. There is potential for agriculture to maintain and even enhance biodiversity and agro-ecosystem services through well-designed policy interventions. Agriculture is a major user of water resources and also contributes to water pollution from excess nutrients, pesticides and other pollutants. But the competition for water is increasing and the costs of water pollution can be high. Sustainable management of water in agriculture is critical to increase agricultural production, ensure water can be shared with other users and maintain the environmental and social benefits of water systems. OECD work on innovation systems in food and agriculture explores the relationships between innovation, productivity and sustainability, and examines the respective roles for the government and the private sector in strengthening agricultural innovation systems and facilitating adoption at the farm and agri-food firm level.